Customize storage, shelves, thermal and cable management, and power distribution components. Congrats to Axonom customer, Middle Atlantic Products, for adding L5 Series Lecterns to its award-winning design-to-order experience. Announced on TWICE, Middle Atlantic has added the Lectern L5 Series to its online configurator and now offers customers two options to order technical furniture. Customers can choose from a pre-configured design or visually customize the lectern themselves with a step-by-step, online design-to-order solution - powered by Powertrak 2D Product Configurator. The pre-configured option is ideal for users in need of a standard design with no customization. There are limited design options with this offering but it's a quick turnaround for projects with tight deadlines. Lecterns are shipped within two weeks. 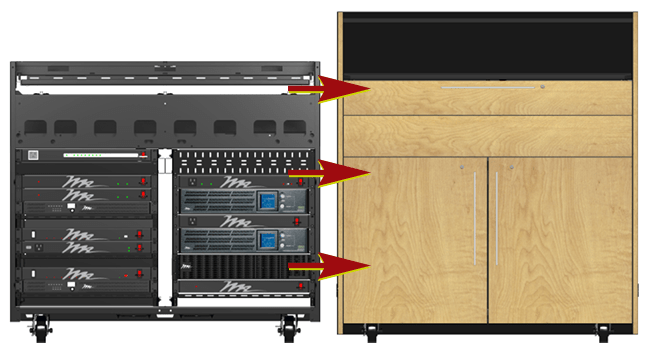 For integrators with specific requirements, the visual design and ordering experience enables users to select and interactively place 2D product images of rack, power, thermal and cable management and connectivity products into the lectern. In addition, they can select the lectern's size, style, finish, frame top and cutout, flip-up shelves, and other component options on Middle Atlantic's website. This tailored ordering experience streamlines the ordering process, calculates pricing, and generates a new, unique part number for the frame's wood kit to quickly determine exact costs. Find out more about Middle Atlantic Products selection of Powertrak 2D Product Configurator and its rapid online registered user adoption to custom-design, quote and order racks with AV equipment, power, cooling, and cable management components.